One of the nice things about running a Bed & Breakfast is getting the opportunity to meet lots of new people from near and far. Among our fantastic guests this past week were James and Angela, who live right here in our “neighborhood” of Western North Carolina. 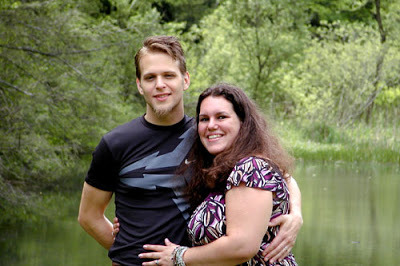 We met James and Angela last year, when they were planning their wedding. Their happy day arrived a week ago today, when they exchanged their vows at Lake Tomahawk in Black Mountain. We then had the honor of hosting them at the Inn for their honeymoon celebration. While James and Angela were staying with us, we also had the honor of meeting and hosting Don and Ginger, another local couple who celebrated their first anniversary at the Inn last weekend. Congrats to them and to all our guests who celebrate anniversaries here at the Inn on Mill Creek. May is a wonderful time of year to get married or to celebrate a special occasion in the mountains. This month is the peak month for wildflowers here and along the Blue Ridge Parkway — mountain laurel, trillium and azaleas are blooming now, with early blooming rhododendron coming in late May/early June. Plus, in related news: the Blue Ridge Parkway at Craggy Gardens is now open with alternative one lane traffic through that area until approximately mid-June, when two-lane traffic is restored (just in time for the peak bloom time for all that spectacular rhododendron)! This entry was posted in Uncategorized and tagged Blue Ridge Parkway, flora and fauna, guests, Spring by Inn on Mill Creek. Bookmark the permalink.